The Centers for Disease Control publish statistics twice a year showing the percentage of households that have landlines or mobile phones or both. It’s an impressive study, with a huge sample. But because it comes out six months after the data, we’ve developed a model to project where the US really is in terms of “wireless substitution” as they like to call it. 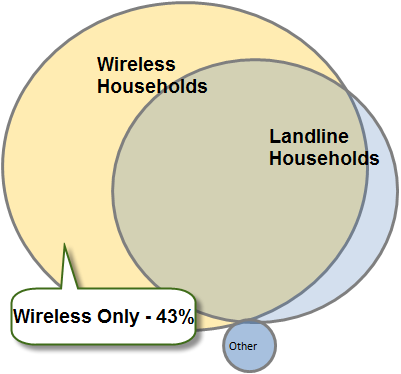 Based on the most recent data, we’re estimating that about 43% of all US households are “wireless-only”, meaning that they do not have a home landline. So the only way you can reach them with a phone call or a text message is on their mobile phone. And that’s for the US as a whole. If you look at specific segments, such as the southern US, urban residents, younger people, etc., the wireless-only statistics are much higher. By the end of the decade – maybe sooner – more than half the US will not be reachable via a landline telephone call.